Over the weekend was Queen’s Prize Tournament, which is a time for Calontir artists that do not already have a Grant of Arms or above (so, Laurels, Silver Hammers, and Calon Lilies cannot participate as an entrant) to make something and get feedback from judges. I’ve been making glass-headed pins since I got my Hot Head torch last Christmas as an experiment. And I was very pleased to find a Roman glass-headed copper alloy pin pretty similar to what I had been making. So, after doing some experimentation with both brass and bronze, I wrote my documentation, and will detail some of the steps here with photos. Unfortunately, I wasn’t able to hold a camera, tend to fire, keep glass turning, etc. with just two hands, so the photos you’re getting below are more or less after the fact and fairly close to my display. 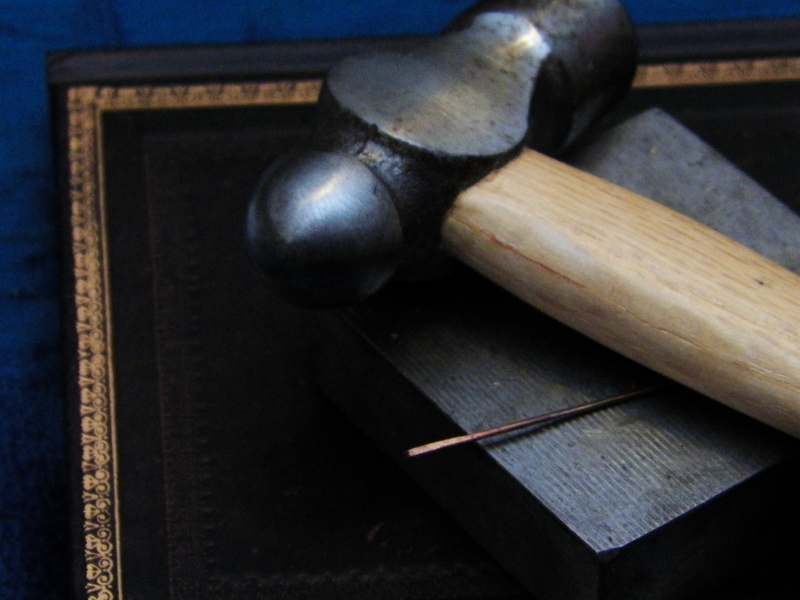 Once the burrs were removed, I then took a hammer and bench block and started by hammering the unsharpened end until it was flat to prepare it for glass to be wound around it. I also took this opportunity to work-harden by hammering. In the extant piece, this does not appear to be the case, as the piece appears to be round, though I have found through experimentation that the glass is more easily wound around a hammered end. Notice the misshaping in the glass on the pins on the bottom. These are brass pins. At the top are bronze pins, which have far fewer bubbles than the brass pins. After the pin has been prepared by work-hardening and burr-removal, I then prep my glass studio for work, starting with ensuring the safety of the studio (yes, I keep a fire extinguisher within hand’s reach! SAFETY FIRST!) and making sure my glass is clean and ready to work with. I also take this time to set out the pins I’ll work with during a session by placing them on a steel block, sharp side out. 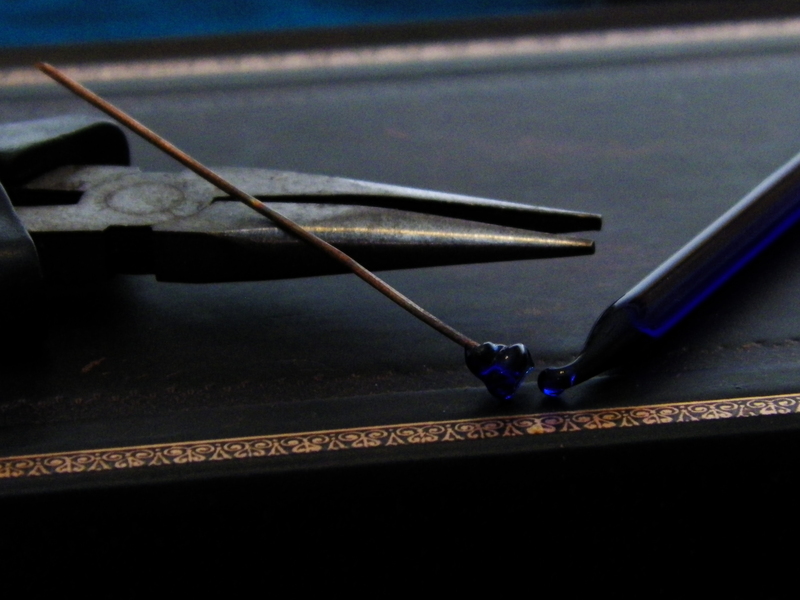 I do this to ensure that the correct tip of the pin is encapsulated in glass, but also so I can work quickly when I switch pins out of the pliers that I use to hold the pin into the flames. It was at this point that I learned that bronze is a far better material to encapsulate in glass, as the zinc content of brass causes glass to bubble due to the zinc gassing out of the brass. This leads to a weaker glass pin that is prone to breakage after the pin is completed. 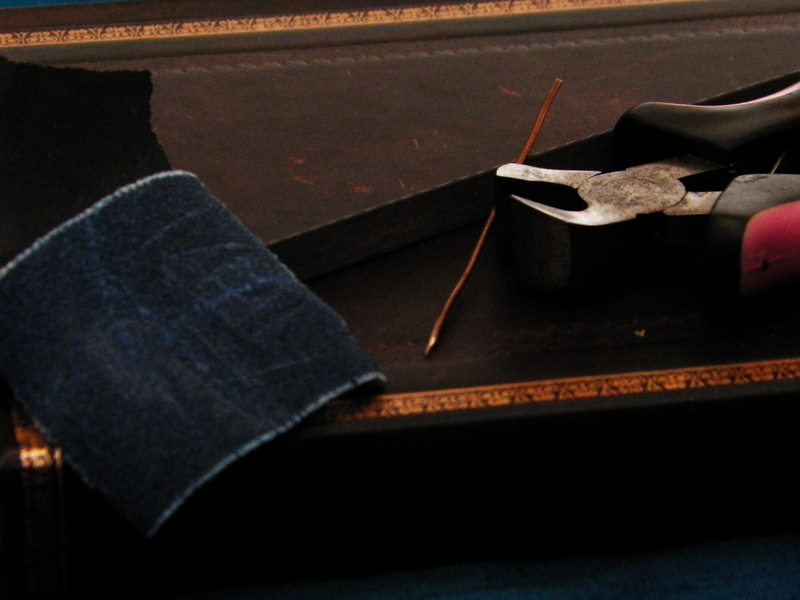 I currently use an old set of jewellery needlenose pliers with cushioned handles where the spring no long works to hold the pin that is currently being worked on. Having actually melted a set of plier handles while doing another glass project meant that using the expensive jewellery pliers is really not the way to go. However, having the insulation is needed, as even a Hot Head torch on propane (which is what I use) can reach temperatures of 1900°F. After ensuring that I have a safe workspace and my safety glasses are on, I then start by heating my glass rod in one hand just above the flame and holding my pin quite a bit more above (about 4” or so) the flame to pre-heat the metal. When the glass is red-hot and has the consistency of stiff taffy, I lower the pin to a much closer working distance (but making sure the pin is still out of direct flame) and start winding glass around it. 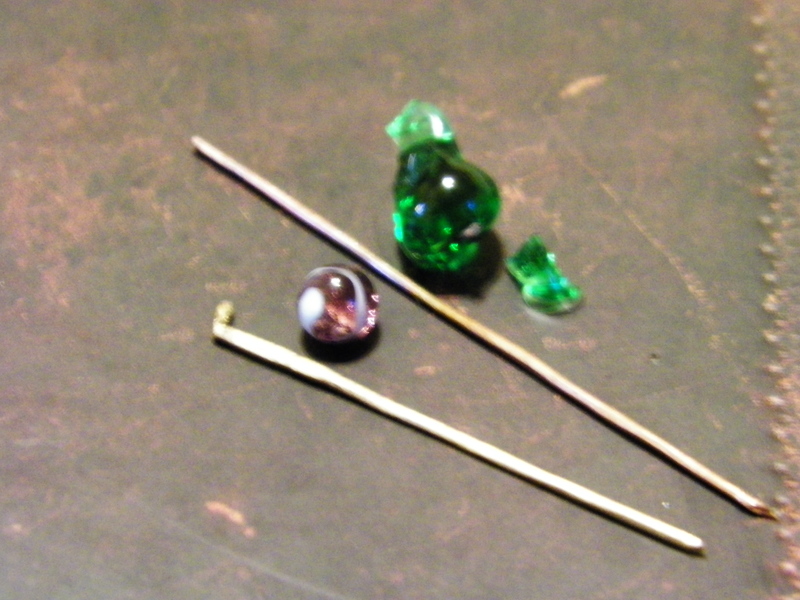 When I think I have enough glass on the end of the pin, I separate the pin from the rod and start to melt in the glass and shape the glass using gravity. At this point, I “bop” the pin in and out of the flame to keep it warm enough to prevent too many stresses, but allow it to cool slowly. It also allows me to further shape the glass-head without a fear of breakage. Once I am satisfied with the shape of the head of the pin, I let it cool slightly outside of the fibre blanket, tap it on my steel working surface. 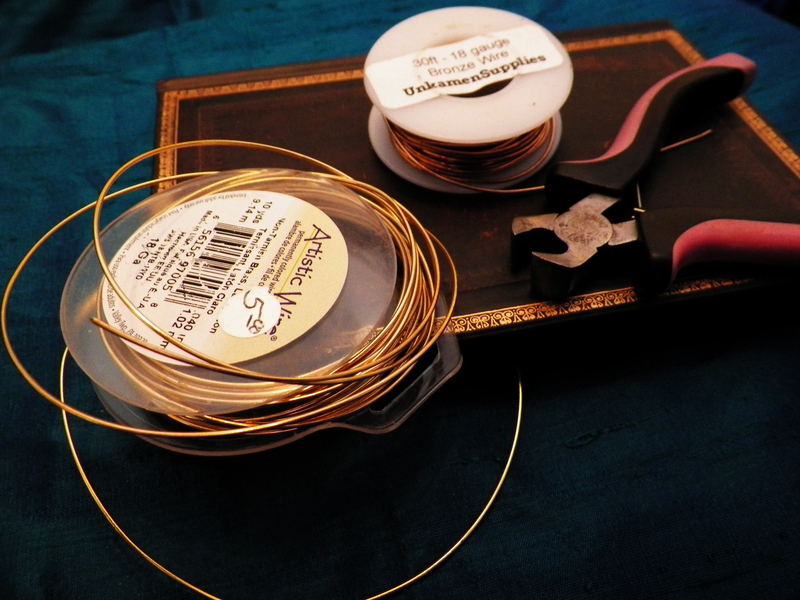 When it “tinks” on the surface, I know it is cool enough to go into the fibre blanket, which is on a warming plate. I let it sit in the blanket for an hour, then pull the power from the plate to let it cool further. This allows the glass to cool slowly and further prevent stress-based breakage. 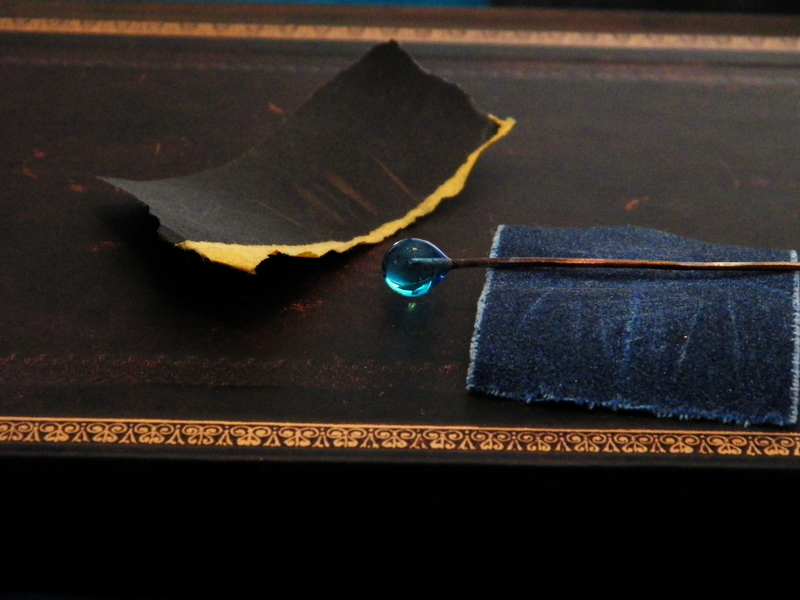 Once the pin is cool, I go back with emery cloth and fine grit sandpaper to remove the fire scale. This also serves to further work-harden and sharpen the pin. The very last step is to wear the pin. As the wire used is fairly thin but still too thick for many modern woven fabrics, I find that loosely-woven silk veils work well with the pins. The pin is long enough to pin the veil into hairstyles, and the micro-abrasions from hammering and sanding the pin help keep the pin in the wearer’s hair. Things that are Useful to know. Torches do get warm enough to melt and weaken both brass and bronze, and mistakes do happen. In fact, here’s a couple of pins, in both brass and bronze, that broke because I essentially melted the metal. The nice thing is that both glass and the metal are relatively inexpensive. I learned a lot at Queen’s Prize, and I had a lovely time learning from my judges and getting people excited to try this out. Even better was drawing the conclusions that the feature of my project shows up in later time periods. This entry was posted in beads, calontir, glass, how-to, influences, jewellery, jewelry, lampwork, queen's prize, Roman, SCA, Society for Creative Anachronism, veil pins, wire and tagged beads, calontir, glass, how-to, jewellery, jewelry, lampwork, queen's prize, roman, SCA, society for creative anachronism, tutorial, veil pins. Bookmark the permalink. These are lovely and your description of your choices and process are very good. Do you think they were wound around the wire in period? What about … err, “dunking” the wire in some molten glass then fire-polishing it round? That’s a really good question, and one my judges actually brought up that I could create a spiral on the unsharpened end of the pin. As for the dunking into molten glass – it would make sense, given how glass 1) arrived to Roman artisans, and 2) how it had to be melted a certain way in an oven or furnace situation. Sort of like a modern glassblower works with dipping the blowpipe into a pot of glass, I’d think. I’m still researching, so lots of questions to find answers to! 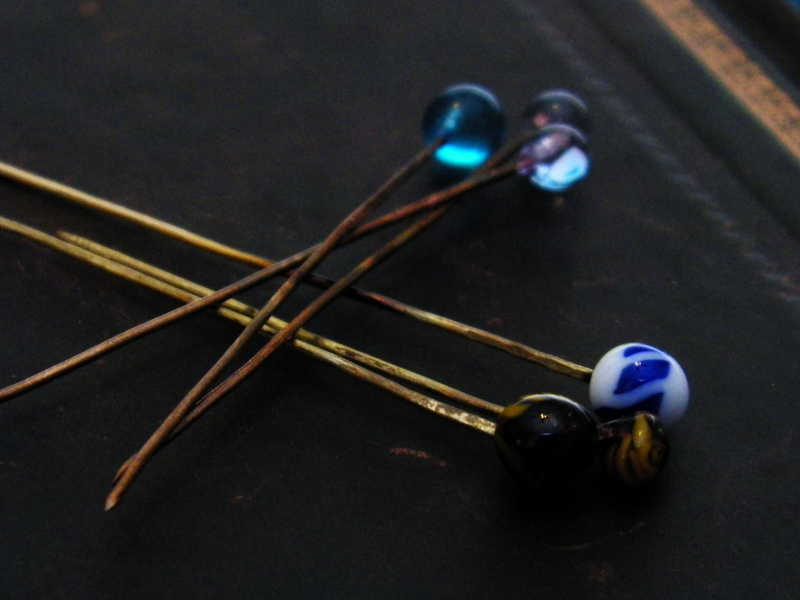 I make a lot of glass headed pins, and have discovered that wooden clothes pins (the 2 wood pins & a spring type) work great at holding the pin while in the flame. 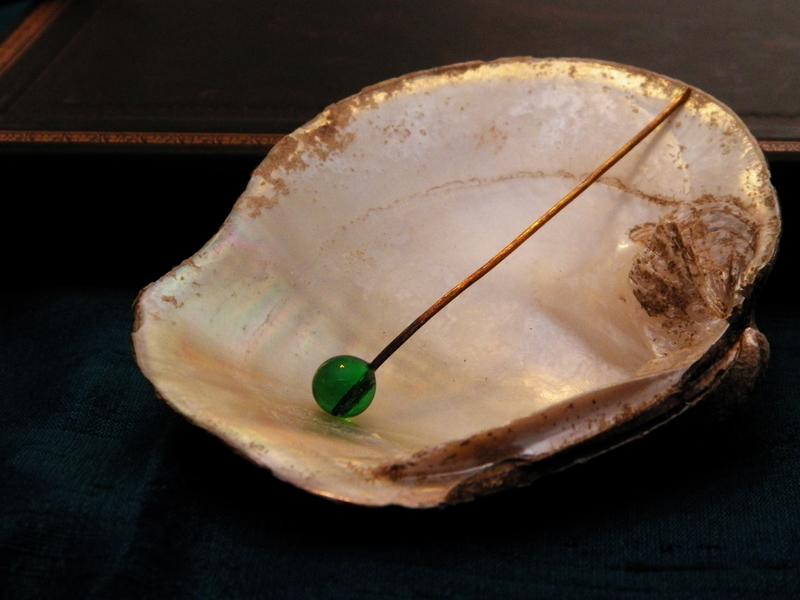 At worst you’ll get some scorching on the wood if the pin gets too hot. I typically prep 24 at a time, then as I make a pin, set it to the side & the head cools while I make the rest of the batch. I line them up as they’re made, pulling the completed pins in order made, to let the last made cool. Good to know! I’ll try it out.